Income Tax raids on the properties of TDP Rajya Sabha member CM Ramesh continued for the second consecutive day. 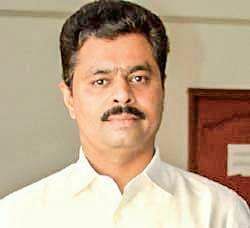 VIJAYAWADA: Income Tax raids on the properties of TDP Rajya Sabha member CM Ramesh continued for the second consecutive day.On Saturday evening, Ramesh returned to Hyderabad from New Delhi after being summoned by the I-T officials conducting searches at his residence in Jubilee Hills and his companies, including Rithwik Projects. The MP was summoned as his fingerprints were needed to open the electronic lockers at his residence. About 60 I-T officials formed into different teams, took part in the searches conducted at multiple locations in Hyderabad. Though searches at the MP’s residence in his native village Potladurthi in Yerraguntla mandal of Kadapa district and at the houses of his relatives concluded on Friday evening itself, the raids on his residence in Hyderabad, Rithwik Projects and other companies continued. It is learnt that the I-T sleuths had taken away some documents from the office of Rithwik Projects for verification. Bank accounts of the MP and his companies are also being scrutinised. Speaking to mediapersons after arriving from Delhi, Ramesh said he was asked to come to Hyderabad by the I-T officials on Friday evening itself. “Yesterday morning, I asked them if my presence was needed, but they said it was not necessary. However, in the evening, when they failed to open a cupboard, which has a digital security lock that needs my fingerprint to open, they called me. As myself and other TDP MPs had prior appointment with Steel Minister on Saturday morning, I returned now after meeting the minister,” he said. The I-T searches at MP CM Ramesh’s residence in Hyderabad, Rithwik Projects and other companies continued on Saturday.